How To Repair Samsung Galaxy J7 J700F Wi-Fi Problems? You surely cannot go a day without using Wi-Fi on your Samsung Galaxy J7 J700F, and this is mainly because Wi-Fi is known to be one of the services that you normally find in your home, offices, airports, public libraries etc. hence allowing you to use internet whenever you want. We need Wi-Fi service not only for socializing, but also for performing work related activities on the go. Besides Wi-Fi, Bluetooth also has significant importance, as it allows you to share your desired data with other for free and without the need of any type of internet connectivity. Therefore having problems in your Bluetooth and Wi-Fi of your Note 3 is surely a big issue that you need to resolve it at the earliest. In the following lines you will get to know about Galaxy Note 3 Wi-Fi problems and their solutions in the best possible manner. Router not found by Samsung SM-J700F. Packets are not transferring at all. Toggle between ON – OFF options of Wi-Fi and check. Restart your Wi-Fi router, as most of the times it is able to resolve the issue. Restart your device and check. Remove battery and re-insert and check. Check for any kind of Firewall on your router. Go with a Factory reset. The very first thing that you need to do is to slightly pull up the antenna contact, if that doesn’t work then re-solder that antenna contact. Check Green Marked Elements For Damage And Resolder / Replace If Needed.Check U2009 For Damage And Resolder / Replace If Needed. Important! In Most Cases J700F Has Problem With Wifi, Because Of U2009 Is Damaged. 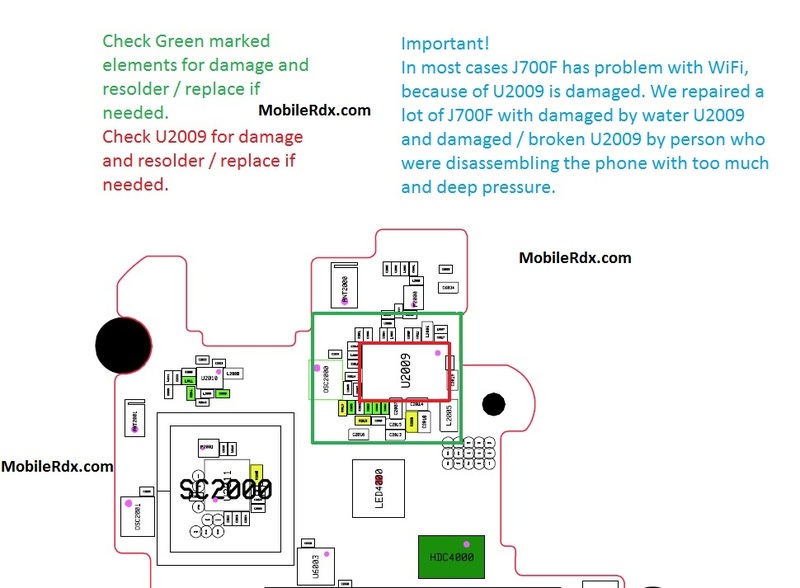 We Repaired A Lot Of J700F With Damaged By Water U2009 And Damaged / Broken U2009 By Person Who Were Disassembling The Phone With Too Much And Deep Pressure.